Matthew Apgar - mapgar@shawmedia.com Prairie Ridge's Jayden Otto pops the ball up as Emily Kelly of Crystal Lake Central defends the net during their girls volleyball game on Thursday, Oct. 15, 2015 at Prairie Ridge High School in Crystal Lake. 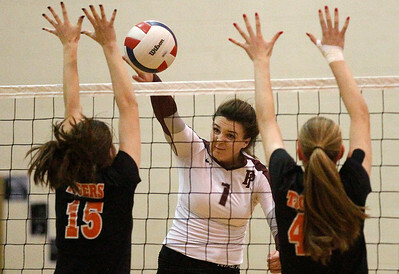 Prairie Ridge beat Crystal Lake Central, 25-16, 26-2. 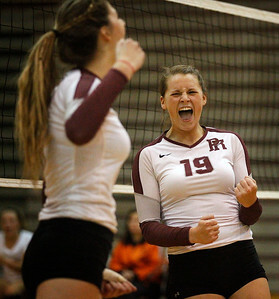 Matthew Apgar - mapgar@shawmedia.com Prairie Ridge's Kirsten Voel-Pel celebrates a point against Crystal Lake Central with teammate Erin McNeil, left, during their girls volleyball game on Thursday, Oct. 15, 2015 at Prairie Ridge High School in Crystal Lake. 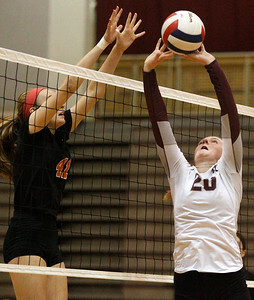 Prairie Ridge beat Crystal Lake Central, 25-16, 26-2. Matthew Apgar - mapgar@shawmedia.com Allison Cole of Prairie Ridge hits the ball between Amanda Ricca, left, and Emily Kelly of Crystal Lake Central during their girls volleyball game on Thursday, Oct. 15, 2015 at Prairie Ridge High School in Crystal Lake. Prairie Ridge beat Crystal Lake Central, 25-16, 26-2. 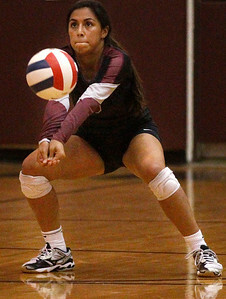 Matthew Apgar - mapgar@shawmedia.com Slone Salerno of Prairie Ridge connects with the ball during their girls volleyball game against Crystal Lake Central on Thursday, Oct. 15, 2015 at Prairie Ridge High School in Crystal Lake. Prairie Ridge beat Crystal Lake Central, 25-16, 26-2. 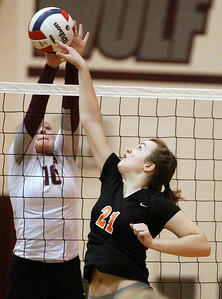 Matthew Apgar - mapgar@shawmedia.com Prairie Ridge's Emily Baudin blocks the ball hit by Olivia Doak of Crystal Lake Central during their girls volleyball game on Thursday, Oct. 15, 2015 at Prairie Ridge High School in Crystal Lake. Prairie Ridge beat Crystal Lake Central, 25-16, 26-2. Matthew Apgar - mapgar@shawmedia.com Savannah Sheridan of Prairie Ridge blocks the ball from Crystal Lake Central during their girls volleyball game on Thursday, Oct. 15, 2015 at Prairie Ridge High School in Crystal Lake. Prairie Ridge beat Crystal Lake Central, 25-16, 26-2. Allison Cole of Prairie Ridge hits the ball between Amanda Ricca, left, and Emily Kelly of Crystal Lake Central during their girls volleyball game on Thursday, Oct. 15, 2015 at Prairie Ridge High School in Crystal Lake. 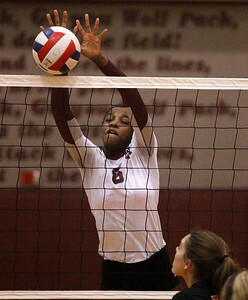 Prairie Ridge beat Crystal Lake Central, 25-16, 26-2.